There are many stories of the beginning and they all begin with light. For the Ancient Greeks, Chaos sprang from the nothingness, her life a stark contrast to the Void. From the joining of Chaos and the Void was Light. That light, for many Polynesian’s, was the Voice of Io – the all-father. When he spoke, the darkness was illuminated and the empty spaces were filled with expanding life. His songs became the fabric of reality, each thread an infinite piece in the tapestry of the universe. Out of the darkness is a series depicting the struggle of existence through a lens of global storytelling. Pieces 1-5 won second place at South Bay Contemporary’s August show, 2014, Juried by Scott Canty. Truly an honor. 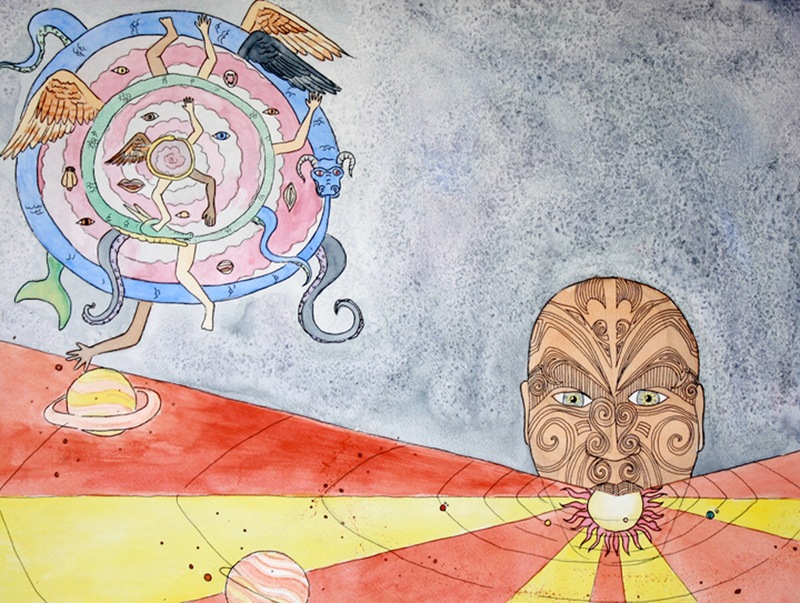 The seven pieces recreate the cosmos using Athabaskan, Polynesian, Greek, Aboriginal and Indian mythologies. K Ryan Henisey is an LA area artist. His works are presently on display at Kellogg University Art Gallery’s Ink & Clay 42, Viral RK25 at Betti Ono Gallery in Oakland, and at the Newhall Aquarium.